According to a recent survey of 191 CDFA® professionals from across North America, the three leading causes of divorce are "basic incompatibility" (43%), "infidelity" (28%), and "money issues" (22%). "Emotional and/or physical abuse" lagged far behind (5.8%), and "parenting issues/arguments" and "addiction and/or alcoholism issues" received only .5% each. 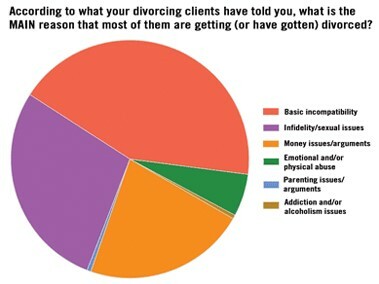 From August 1 to 29, 2013, 191 CDFA professionals from across North America responded to the question: "According to what your divorcing clients have told you, what is the main reason that most of them are getting (or have gotten) divorced?" “The incompatibility is usually caused by one or more of the other choices,” another CDFA professional added. Several of the CDFA professionals surveyed noted that the most commonly cited cause of divorce they hear from their clients—“basic incompatibility”—is usually created by deeper issues somewhere in the relationship—usually an emotional, physical, or financial breach of trust. This may help to explain the difference in findings between this survey and the findings of a 2012 academic study. “Examining the Relationship between Financial Issues and Divorce,” published in the Family Relations journal (v. 61, No. 4, Oct. 2012), looked at data for 4,574 couples as part of the U.S.-based “National Survey of Families and Households”. In the study, researchers Jeffrey Dew, Sonya Britt, and Sandra Huston examined data related to what couples argue about—including children, money, in-laws, and spending time together—and then looked at which of those couples were divorced four to five years later. According to the study, financial disagreements were the strongest disagreement types to predict divorce for both men and women.